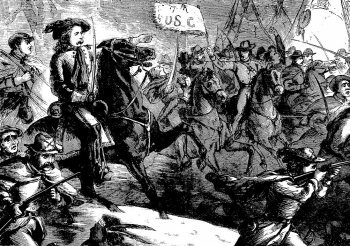 In the 1970 film, Little Big Man, General Custer and the 7th Cavalry are depicted charging to the Washita Massacre at dawn to the tune of “Garryowen,” an old Irish drinking song that Custer loved and that he had made the regimental anthem. We know this much actually occurred from Custer’s own report to General Sheridan about the battle on November 27, 1868. A few other facts were agreed upon by interested parties but the battle sparked a media war between those who thought the carnage justified and those who immediately labeled it a massacre. Phil Sheridan was the first to weigh in with a short, rosy report in the Daily National Intelligencer within a day or two of hearing from Custer. He stated that a few more actions like this and the Indian troubles in his department would be fodder for tales to grandchildren. A nearly identical report appeared five days later in Ohio’s The Ripley Bee. On December 11, Little Phil’s Civil-War-protege’s official report was printed in full in the Newark Advocate (Ohio). Oddly, the name of this famous fighter was spelled, “Custar.” The modest general saluted his troopers, told of four hours of hand-to-hand combat, and regretted the loss of life among women and children that resulted from “the excitement of the fight, as well as self-defence.” He lauded specific actions by his officers, calling out in particular that a son of Black Kettle shot a horse out from under Captain Frederick Benteen (Custer’s nemesis and a major figure of the Little Bighorn fight eight years later) who then dispatched said son. By his report, 103 warriors were killed, including the peace chief, Black Kettle. A trove of weapons and horses were taken and over 800 ponies were slaughtered. The movie version makes this look like some whim on Custer’s part but the intent was to deprive the First Nations people of their transportation. The papers reported on the “very handsome” lodge that Custer took time to have taken down and packed for his own trophy. Not all Indian agents were mendacious troglodytes. 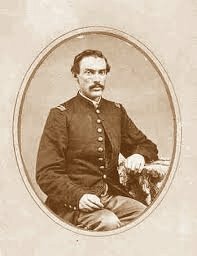 One of the more prominent ones was Colonel Edward Wanshear Wynkoop (1836-1891), a founder of the city of Denver, Colorado. On December 12th, Wyncoop tendered his resignation and resigned his commission, dated the day after the Washita massacre, over what he believed was nothing less than an atrocity committed against friendly Indians who were on their way to the reservation. He had previously been the investigator of the Sand Creek Massacre (November 29, 1864) and was the first to label that action as such. 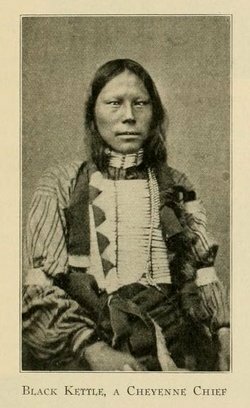 Among the prisoners taken by Custer’s forces (53 squaws and their children) was Black Kettle’s sister. 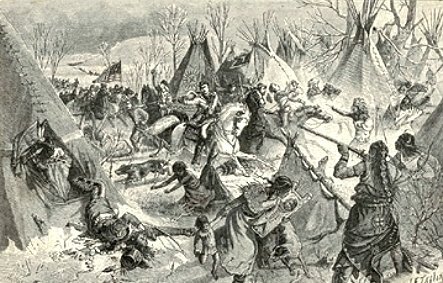 According to a 21 December news article, Little Phil reported that she reported that the Cheyennes had been out raiding. Sheridan stated that contraband from raids and murders were found in the Cheyenne camp on the Washita. This is not reported in Custer’s official dispatch. He instead pointed out that a white child, a captive of the Cheyenne, had been killed by a squaw in a brutal way and that some of the squaws were armed when taken prisoner. How either of these, if true, were germane to the question of an assault on the camp remained unclear. Black Kettle had registered at Fort Cobb to come into the reservation. By New Years Day, 1869, one of Custer’s least-favorite generals, William Babcock Hazen, made public a letter from a white woman captive, dated three weeks before the battle, that he had been in negotiations to get released. Hazen would later criticize Custer in a book. Mrs. Blinn was killed during the battle and, before a Senate committee, an Army officer reported that her death was from friendly fire. 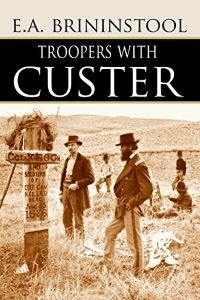 By the end of January, papers were reporting that some senators were now calling the incident the Washita Massacre and they believed that Custer had hurried out of the fight to report a victory while leaving his dead on the field for fifteen days. February 8th brought the most damaging article to date. Anyone who has read the Benteen-Goldin Letters cannot help but recognize the style of Fred Benteen’s writing in a letter published anonymously in the The Missouri Democrat. The letter was written to an old Civil War colleague, probably with instructions to shepherd it to publication (which Benteen denied). It was reprinted in the New York Times on Feb 14. The letter’s caustic tone clearly laid the blame for all that happened at Washita squarely on the commander’s shoulder straps. Benteen’s greatest fury was over what he perceived as the abandonment of Joel Elliott (a friend) and his troopers. But he also made Custer sound like a sadistic juvenile on an afternoon sparrow-shooting romp. The media war continued through 1869 and beyond. The truth of the matter, whichever truth you’re seeking, can hardly be derived from the articles published soon after the event. They are nevertheless fascinating and representative of a fracture in American sentiments, politics, and military as the Indian Wars ground on. After June of 1876, both sides pretty much knew the war was to be decided in one way.